Telangana Engineering Common Entrance Test TS ECET 2016 Notification, How to Apply, Syllabus, Hall Tickets, Results etc from official website. 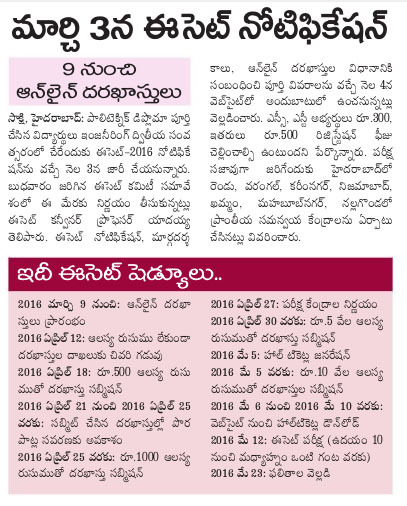 Telangana Engineering Common Entrance Test (TS ECET-2016) will be Conducted by Telangana State Council of Higher Education TSCHE, for admissions into Bachelor of Engineering B.E, Bachelor of Technology B.Tech, Bachelor of Pharmacy courses offered in Universities under Telangana State for the Academic year 2015-16. Last date of submitting online applications is 12th April 2016 without late fee. Application Fee: Rs.300/- (for SC/ST), Rs.500 (for Others) Paid through AP/TS Online Centers, MeeSeva, Eseva centers or through Debit Card/Credit Card online payment.